Battle of the GOATs: Serena lost to Federer in mixed doubles on Tuesday. 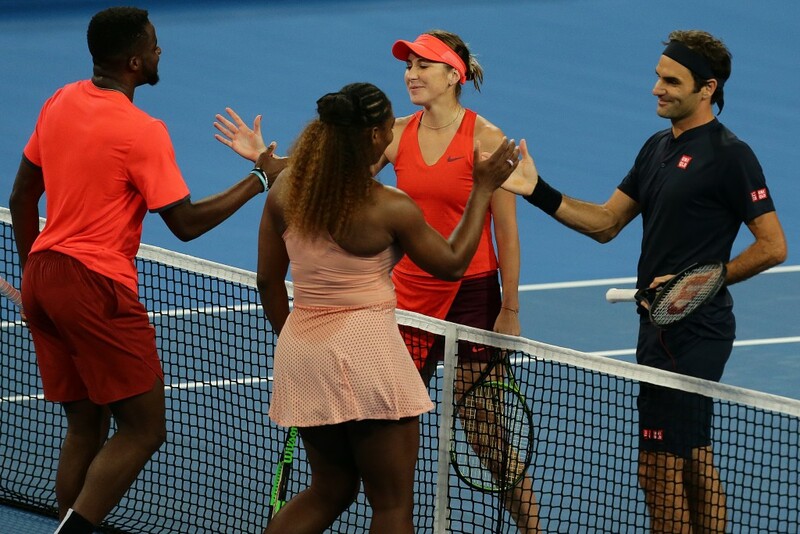 A historic New Year’s Day in Perth ended with Serena Williams and Roger Federer trading compliments about their famous serves after the two legends squared off in mixed doubles at the Hopman Cup. Federer and his partner Belinda Bencic combined to defeat Serena and Frances Tiafoe 4-2, 4-3(3) to secure victory for Switzerland against USA in the mixed team competition in Western Australia. 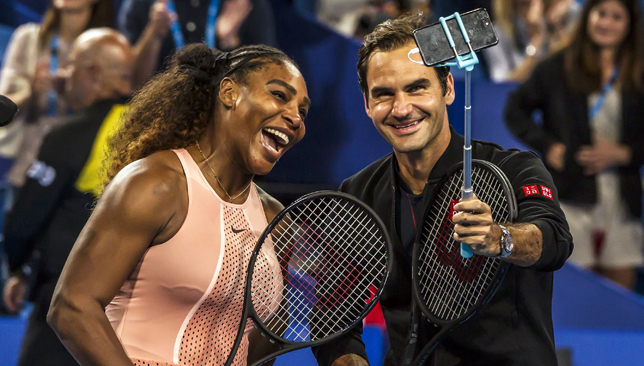 After the one-of-a-kind showdown, dubbed as ‘Battle of the GOATs’, Federer and Serena, who own 43 Grand Slam singles titles between them, were interviewed together by Todd Woodbridge. “It was a great experience, I’m kind of sad it’s over, I was just warming up. It was so fun,” said the 37-year-old Serena. Both Federer and Serena struggled to return each others’ serve and the Swiss later explained what it was like facing the 23-time major champion. “I was nervous returning, because you just don’t know. People talk about her serve so much and I see why it is such a wonderful serve, because you just can’t read it,” he stated before Serena interrupted him saying: “I can’t read yours either”. Federer continued: “We have the same qualities but yours is a bit better. For me it was a bit nerve-wracking too to be honest because all of a sudden, especially the last serve at 3-all, I’m like, ‘I got to win this point, but it’s Serena Williams’, and I was telling myself, ‘This is maybe what I’ve always wanted, a big time moment like this’, and I made the serve but then I actually totally missed the target, and thank you for missing for missing the all. It was great, great fun. Serena feels Federer’s serve is actually underrated and joked that she’ll ask him for tips later. “The guy is great, he’s the greatest of all time to be honest, both on the court and off the court, he has such charisma,” said Serena. Earlier in the day, Serena came from a set down to defeat Bencic 4-6, 6-4, 6-3, while Federer downed Tiafoe 6-4, 6-1. Novak Djokovic has got Roger Federer’s men’s all-time record of Grand Slams won on his mind but admits it will be a great challenge for him to get there, especially with the young generation stepping up. 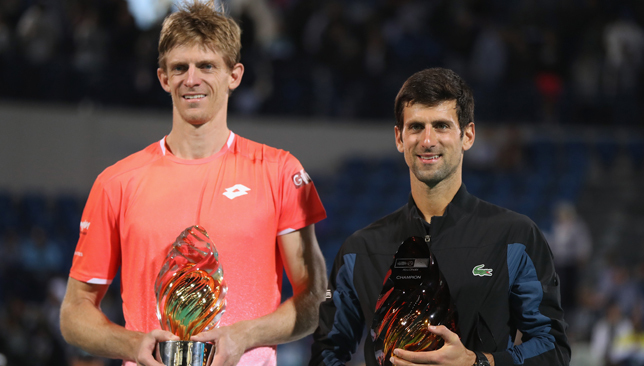 Djokovic, who sent out an early warning ahead of the official kick-off of his 2019 season with his 4-6 ,7-5, 7-5 victory over Kevin Anderson to win the Mubadala World Tennis Championship in Abu Dhabi on Saturday, took his Grand Slam tally to 14 by picking up the Wimbledon and US Open titles within the span of the last five months. The Serb is currently six majors behind Federer and three adrift of Rafael Nadal, but is likely to keep up the pressure on his rivals this upcoming season considering how he’s recaptured his dominating form in the second half of 2018. Asked if there is a record he dreams of capturing before the end of his career, Djokovic said: “I would lie if I say I didn’t want to get to as high as Grand Slam wins number possible. That’s definitely the objective, the desire, the goal. What is @DjokerNole‘s greatest challenge? Djokovic lost just three times in the last six months, but it’s worth noting that all three defeats came against players aged 22 and under (Stefanos Tsitsipas in Toronto, Karen Khachanov in Paris, and Alexander Zverev in London). On Thursday, the 32-year-old Djokovic conceded that “the face of tennis is changing” due to the influx of new young talent and he believes the ‘Next Gen’ will make it harder for him to stay on top. “There’s a new generation of players, Nadal and Federer are still there, [Andy] Murray and [Stan] Wawrinka are coming back, Zverev is the leader of this Next Gen… men’s tennis is as good as it can be in terms of competition, in terms of personalities, it’s good to see new faces,” he said after his title victory on Saturday in the UAE capital. Djokovic, who looked in top form throughout the weekend in the UAE, now heads to the Qatar Open in Doha where he faces Bosnian Damir Dzumhur in the opening round. The final against Anderson was a high-quality affair that ended with what Djokovic described as one of the best match points of his career. The pair, who faced off in the 2018 Wimbledon final, were fired up and pushed each other to their limits in the deciding set. Anderson, the defending champion, saved three championship points at 4-5 in the decider but succumbed on Djokovic’s fifth opportunity two games later. “I was much better against him today than I was in Wimbledon or the London Finals. I know my game is getting better and better and I feel it’s at a stage where it’s good enough to beat him. I have to play well, take my opportunities, figure things out, but I feel like I’m right there and I think I further proved that to myself today,” said the sixth-ranked Anderson. Nick Kyrgios is taking a relaxed approach to his title defence in Brisbane, admitting he feels rusty for not spending much time on court during the offseason, and toyed with his home press telling them he “probably wouldn’t play for the rest of the year” if he wins the Australian Open. The 23-year-old Aussie, who slipped to 35 in the world after a tough 2018 that saw him battle elbow and hip injuries, said he intends to play a “light schedule” in 2019 in an attempt to avoid home sickness while on the road. The Canberra-native has been outspoken about his mental struggles in the past, and how he lacks motivation when he spends several months traveling away from Australia for tournaments. In the build-up to the Brisbane International (kicks off on Sunday), Kyrgios spent two days in the hospital treating a spider bite on his foot. The bite caused his foot to be swollen and prevented him from hitting the last couple of days. “When I got home I didn’t touch a racquet for a month,” Kyrgios told reporters in Brisbane when asked about his offseason and whether he spent much time hitting on court. “Not at all. I spent a lot of time in the gym, I was playing a lot of basketball, just being home. I feel like the offseason for me is not about getting on court and trying to improve or get better. I want to completely step away from the game and like really just enjoy my time at home. I play enough tennis during the year, I’m sick of bit by the time I get home. So the last thing I want to do is go out there and hit more balls. “I’ll probably be rusty. I wouldn’t be surprised if I go out there and hit like 30 unforced errors, doesn’t matter to me. While all players spend at least two to three weeks of their offseason going through gruelling training blocks and making improvements to their game, Kyrgios sees it differently. “I don’t know if it’s an outlook, I just don’t want to play when I’m sat home with my family,” he states. Kyrgios contested 38 matches across 14 events (plus one Davis Cup tie) in an injury-plagued 2018 and it sounds like he plans on playing less in 2019. “I’m going to play a very, very light schedule this year,” he said. Asked about his goals for the new season, Kyrgios added: “Not much to be honest. Have a light schedule, when I play, enjoy playing and go out there just compete. I haven’t really set any goals or anything like that. That last remark was an obvious exaggeration, meant to lure reporters into taking his statements seriously. The former world No. 13 did confirm though that his physical problems are behind him for now. “Obviously I’ve dealt with a couple of injuries last season. I think being home just solved all my problems really. I was away from home for like five and a half months. I don’t really want to ever do that again. I was just looking forward to going home. I was in the gym a lot, I feel good. The elbow is feeling good. Kyrgios’ first round in Brisbane is a rematch of last year’s final against American Ryan Harrison. He remains coachless but was working with his strength and conditioning coach Ashcon Rezazadeh in Canberra during the offseason, and is accompanied by the Brit in Brisbane this week.